Fruit for the Apocalypse, a new artist collective, organized their first event in conjunction with the first celebration of the World Listening Day, launched by the Chicago based World Listening Project, in partnership with the Midwest Society for Acoustic Ecology on the 18th of July (for the birthday of the Canadian composer R. Murray Schafer, one of the founders of the Acoustic Ecology movement). The event was celebrated by dozens of artists across the globe, from Alaska to Taipei. In the middle of the sunny Sunday afternoon I take a walk to Hoxton, and trot down into a small garage, announced as the “secret underground venue made of concrete where machines are as much dancers and musicians as their human collaborators”. Two days before I attended the preview of the event at Cafè Oto in Dalston (which was recorded and played at the Brown Rice, in Chicago) but as I enter the car park I find a whole new dimension. Chinks of light filter through the walls as the small crowd slowly moves through the refreshing grey limbo. Seven performances, cyclically perpetuate a minimal urban inferno. The sound scapes, mainly based on field recordings sampled from East London’s busy streets, have now a breathing body, and a human face. Among the seven underground circles of the listening embodiment, more than one performance caught my attention. Be aware of the silence from where sound starts: here’s a girl wearing an ethereal concrete flower costume, kneeling next to her indian tambura, a long necked plucked drone lute, mastering the continuos stream of sound. 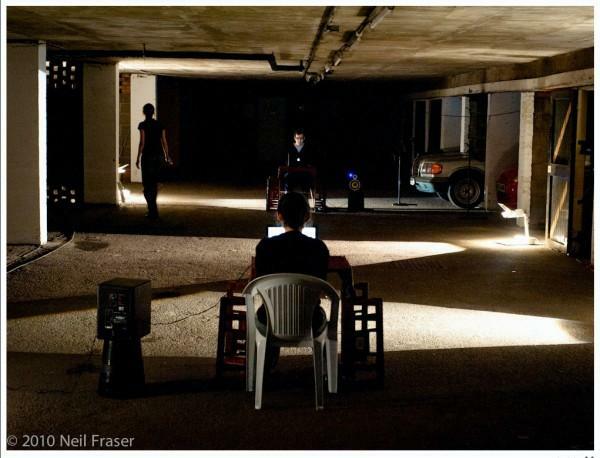 Two square arms: where an actor stretches through a narrow garage box interpreting with repetitive and frantic movements the absurd pressure of the city life routine. START! – a neofuturist opera in 5 movements: feeding the urban appetite for collapse, the performers engage the public in a complete tour of the site. A conductor directs a quartet for three car engines, horns and radios into the sublimation of a traffic jam. The last words of the manifesto, recited in an opera fashion as an apocalyptic bedtime chorus by a woman behind a wall and a man sitting by a world globe light (with a vintage recording of a nightingale playing in the backround) sound together disarming and conforting : art will not save the world. East London Soundscapes was an afternoon of sound and dance performance curated by the new collective Fruit For the Apocalypse. Held in a ground-floor car park in Hoxton it was a dusty and unpredictable afternoon. The evening consisted of seven consecutive pieces which we, the audience,followed around like a swarm of moths. We followed the lights which bounced on and off to indicate the beginning and end of each piece. The space was revealed and amplified beautifully by the performances – the car park was long, but it looked really long when we watched dancer Aleksandra Borys hovering in the middle of it like a distant image between the two sound artists Lucia H Chung and Martin Thompson, both buried in their laptops. And the walls were rough and cornered but watching Baptiste Bourgougnon dancing to hectic chapters of sound, by Alexandra McGlynn and Aurelia McGlynn Richon, there seemed to be nothing much else around him other than corners and walls. Tight walls. All the pieces seemed to make themselves belong. START! (briefed as ‘a neofuturist opera in 5 movements’) by Joseph Young and Christine Lockhart could have benefitted from quieter acting (metaphorical volume of course) and a sharper edit but the whirlwind it created around the space was refreshing and I was endeared by the comfort it had with placing the obscure alongside the explained. The space was also used in other pieces like a conventional theatre – the parking bays acting as wings or frames. The space was great. It held the sound without us forgetting the street outside. It could be reinvented over and over again. The pieces were supported by it – occasionally overwhelmed by it. The loveliest thing to see was the space being considered and inhabited – not shouted about. The piece titled ‘Be aware of the silence from where sound starts’ by Victoria Karisson and Deborah Anne let me be aware of just that. It also let me drift off to sleep… but with the image of the back-lit performer squatting under my eyelids alongside my dreams. The sound coming and going. Am I sleeping or is this the silence? It was a good way to spend an evening. The space invited so much curiosity that I actually would have enjoyed the possibility to walk around more. To have the freedom to wander and discover performances independently – to feel an intimacy and investment with the pieces. The best thing I saw in the whole evening was when I had just arrived and all the lights in the car park were still off. I found a dancer dancing in the dark – she made small focused movement. I was the only person watching, standing about two metres away from her. It was a beautiful performance (maybe she was warming up, I do not know) and because I had found it I wanted to continue watching it, however boring it might have become. For the length of the evening to be sustained the idea of installation could have been cultivated even more. Time can move with ease when it is in our own hands but when it is not and the audience begins to move (as it did) as a group of tourists would on a guided tour, then something withers. Time is laboured. Still – I looked forward to the next dish served by Fruit For the Apocalypse. My appetite has been whetted.